WHO DOES THE DISHES?- Who should pay the bills? Do the laundry? Work outside the home? Stay home with the kids? For many couples, answering these questions is difficult and frustrating. How do you decide which family responsibilities belong to you and which belong to your spouse? Winston Smith explains that we might be surprised by what God, in the Bible, says about marital roles. The Bi-ble doesn't have a simple, one-size-fits-all "to-do" list for husbands and wives, but there is a basic principle to live by--sacrificial love. 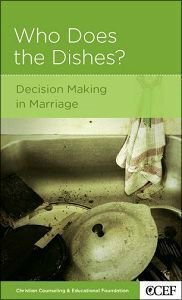 Learn how to apply what God says about love to the everyday decisions you make with your spouse. About "Who Does the Dishes? (Christian Counselling & Educational Foundation Series)"